* Archeer is the ONLY authorized seller of Archeer Brand products, 2nd hand purchase or purchase from a non-authorized seller/distributor will not covered by our warranty. 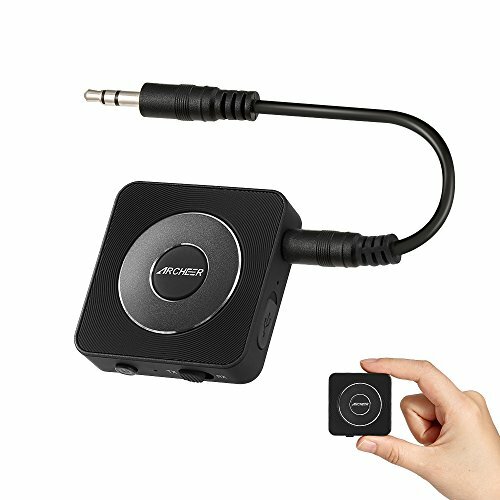 ❤Transmitter and Receiver: Whether you want to stream music to wireless headphones / speakers or make your old sound system wireless capable, the ARCHEER 2-in-1 Wireless Transmitter and Receiver is your perfect choice. Switching between transmitter and receiver mode is as easy as flipping a switch. ❤Mini and Lightweight: this transmitter and receiver is only 3.36oz, 1.65*1.65*0.39 inch, compact and portable design build to easily tuck away and take on your travel, let the music/audio please you anywhere. ❤Double Link, pulse of pleasure: This Bluetooth transmitter supports connect two devices simultaneously. Enjoy late TV shows with your beloved together while not disturbing your sleeping baby. ❤13 Hours Battery Life: Built-in rechargeable battery, this device can provide up to 13 hours of work time after fully charged for 1.5 hours, also support charging and streaming at the same time. Note: If you want to connect to your TV by Optical TOSLINK, please search ARCHEER transmitter and receiver.